Many would remember it as that restaurant where Pinoy, Chinoy, and Tisoy cuisines merged, and which became a landmark off Echague Street. While it has since moved to 750 Florentino Torres near C.M.Recto and Soler Streets, the aura remains the same. It helps that the furniture exudes the same illustrado character, where an Amorsolo-ish painting hangs on one side of the wall and where menu offerings are written in chalk on boards hanging on another side. And there’s that lone boar tied to the door…………. Could that be “Liempo” or “Pork Chop”? The “best of both worlds”. East and West? Ambos Mundos. I can imagine men in tailored suits (yes, they really dressed up back when Recto Avenue was still called Azcarraga) dining here. Perhaps feasting on either Paella Ambos or Morisqueta Tostada. Or would it be Lengua or Buntot Estofada? Many Filipinos think of Callos and Morcon as “fiesta fare” — special dishes served whenever there is reason or an occasion to celebrate. In the same breadth, Filipinos likewise drool over their favorite local food, and by that, I mean favorite local Filipino and Chinese food. Crispy Pata, Bulalo, Lumpia Ubod, Pancit Bijon, Asado, etcetera! 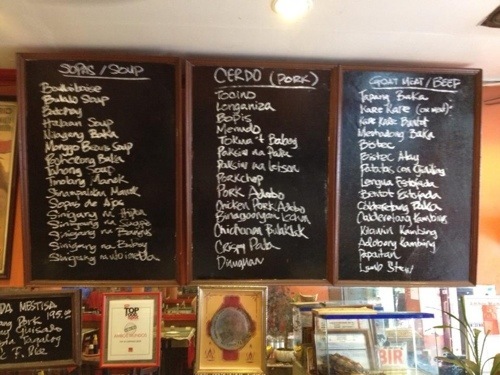 That menu is a real fusion of Chinoy, Pinoy and Tisoy Cuisines. Is it really the oldest restaurant in the country? Both Ambos Mundos and Panciteria Toho Antigua claim to be the oldest, having operated since 1888. Who’s to tell? Both were my childhood favorites, by the way. But where Toho appears like many other old Chinese restaurants, Ambos Mundos has an altogether different charm. Very old world. Complete with pot-bellied black pigs tied to its front doors! (A recent addition, I suspect) Some keep pet dogs. Or pet kittens. But pet boars? We’re told they’re there for good luck. There must be a grain of truth in that. After all, they’ve been around since 1888! My 2 amigas eagerly wait for our order of Morisqueta Tostada, Lengua Estofado and Patatas con Giniling. 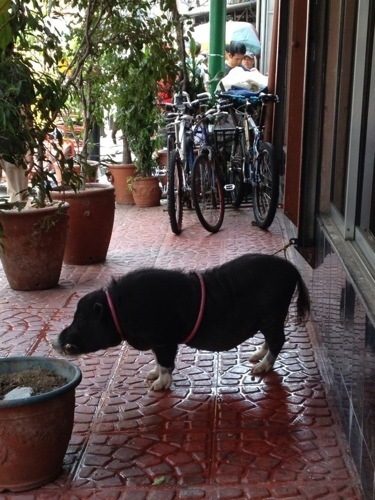 Another set of pet boars just across the street in Wah Sun, same owners. 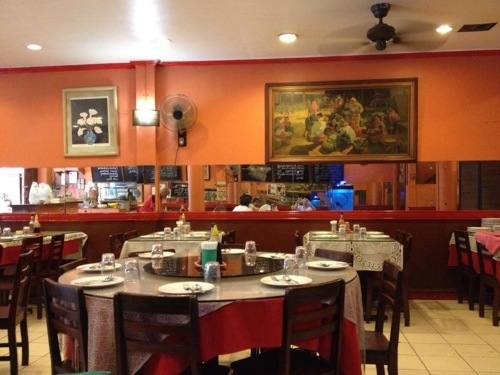 A Gaudinez married into the Leung Family who owns this Chinese resto since 1955. They say you can order from either/both menus of Ambos Mundos and Wah Sun across the street. Same owners. Addendum: This is even more interesting. 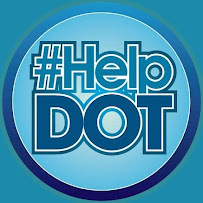 Thanks to Teresa Gaudinez-Martinez, I now have a chance to straighten out some “kinks” and misinformation in this blog. Foremost is that THIS IS NOT THE AUTHENTIC AMBOS MUNDOS RESTAURANT. 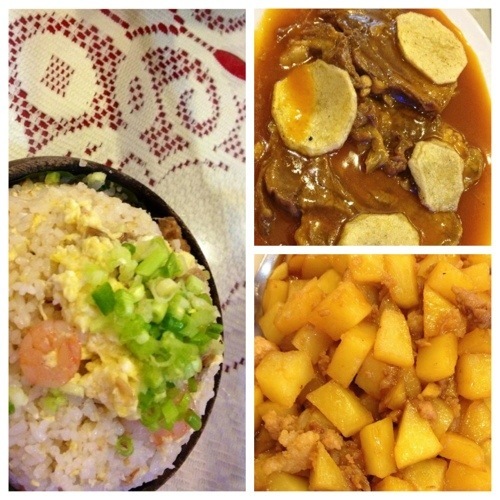 “Both Worlds” (Ambos Mundos) refer to Spanish and Filipino cuisines. NEVER INCLUDED CHINESE CUISINE. Huh? 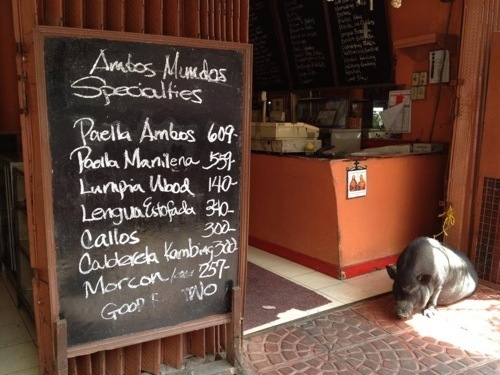 And there was NEVER A PET BOAR outside the restaurant. Huh again! Teresa, I have read all your blogs and sympathize with your legal woes. Obviously, there’s a long story fraught with family, legal, proprietary rights issues here. Thank you for taking the time to make the corrections. To our readers, here’s the link to Teresa’s Ambos Mundos blogs. This is not an authentic Ambos Mundos Restaurant. As the legitimate registrant of the business name, I would have to correct the impression that might be given by this post. 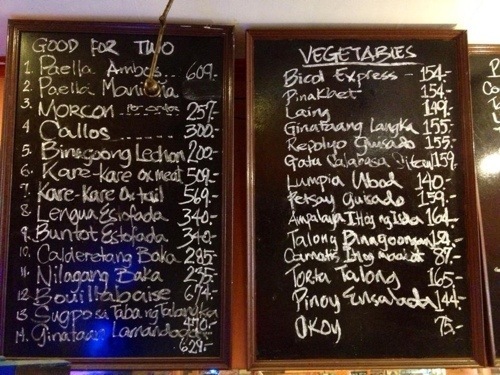 Much as I like Chinese food, Ambos Mundos Restaurant has only offered Filipino and Spanish dishes in keeping with the meaning of its name which is Two Worlds or Both Worlds. Our old customers could attest to the fact that we have never placed a black boar in front of any of our legitimate branches. If you wish to know the real story of Ambos Mundos Restaurant, you can probably visit my site just-passing-thru.com. My inability to open an authentic and legitimate AMBOS MUNDOS RESTAURANT in spite of being recognized as the legal registrant to the business/trade name is one of my greatest woes in life . It pains me so much not to be able to direct customers to a legitimate establishment at this time. It pains me even more to read so many bad reviews for the food they serve while carrying our name. It would appear that the false claimants continue to take advantage of our legal system which tend to make life difficult for complainants like me when appeals which are clearly dilatory tactics seem to be endlessly entertained. I look forward to the day when I can give you a real AMBOS MUNDOS RESTAURANT to check out so our restaurant will be given the chance to prove its worth. I continue to fight for our rights and the correction you have done in this post is very much appreciated. So where is the “other” and authentic Ambos Mundos now? 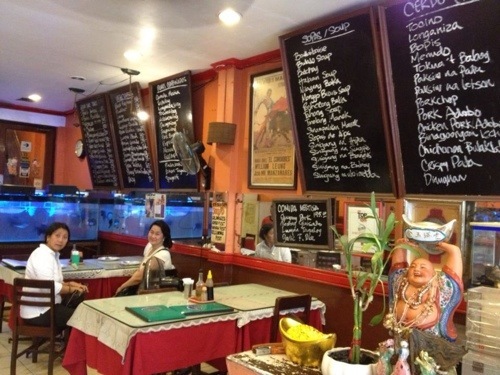 as far as i remember, a sister of my grandfather owns a restaurant named ambos mundos… her name was blandina leung. w/c already departed. as i remember. the crocodile inside the aquarium within the second floor,wasn’t easy to forget. hehehe she has a son named benjie..
« Sightsee. EAT. Rest. EAT. Repeat.